The Amarrian Ark serves as the true jack of all trades amongst Jump Freighters. With the third largest cargo hold (falling _just_ behind the Anshar), and boasting the second highest structure hitpoints and second lowest align time, this freighter is a solid choice for all purposes. The on-board jump drive makes the Ark a desirable choice for transporting mass amounts of cargo through low and null security space quickly and safely, though incurs extra costs in exchange. As a Jump Freighter, the Ark is not suited for combat and any situation that might put the Ark in danger should be avoided at all costs. However, there are measures the pilot can take to help reduce the chance he loses his ship if attacked. Thanks to the massive base structure health of the Ark, Mechanics is a very desirable skill to have trained to V, increasing the chance the freighter can escape combat. The Ark also has a notable amount of armour, making Hull Upgrades another obvious and quick choice for extra cargo space. And even more so than both of those skills combined, the Jump Freighters skill boosts your ship's hitpoints by an incredible amount, far beyond that which a normal Freighter could reach. Typically, Freighter pilots are moving cargo from place to place in order to make money, in one way or another. Keep costs down is vital, decreasing fuel requirements and increasing the jump range can reduce costs substantially over the long run. Train Jump Drive Calibration and Jump Fuel Conservation to at least IV, though preferably V as soon as possible, reducing the number of Cynosural Fields you need to move between two locations and cutting back on the amount of ISK you need to spend on fuel. The Jump Freighters skill further improves on fuel economy, so train that as far as you can. Though the Ark only needs level IV of this skill to be piloted, highly consider taking Amarr Freighter to V as soon as possible. This will both boost the cargo capacity of the ship, reducing the number of trips needed to transport goods, as well as improving the ships inertia allowing you to travel between stargates faster. Though expensive, consider using ORE Expanded Cargohold modules if you wish to cram your freighter with as much as possible. Your structure is most of what is standing between you and any pirates seeking to take down your ship in high security space and it is important you keep it as high as possible. The ORE variant penalises your structure less than the standard Tech II module does, and it also increases your cargo hold further than Tech II as well. 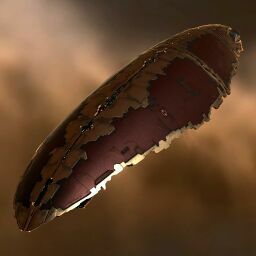 Jump Freighters, thanks to the skill of the same name, are also innately tankier than standard Freighters. Reinforced Bulkheads will increase your structure hitpoints by a considerable amount for when you are carrying expensive cargo. As with the Expanded Cargohold, consider running the ORE variant of the Reinforced Bulkhead as well, for similar reasons; it increases your structure even more, and reduces the cargo hold penalty. Finally, do not forget to consider Jump Drive Economizers. A single Economizer can reduce the fuel costs of each jump your Ark takes by between 4% to 10%, depending on which meta level you have equipped. Calculate how much fuel you are using for each jump, and decide where or not it is worth it over the potential loss in cargo capacity from not equipping Expanded Cargoholds instead. For more info on fittings, please go here. As is typical for freighters, it is important for an Ark pilot to stay vigilant and ensure they spend as little time as possible in areas they can be attacked. Consider bringing allies or your own alts with you, with Stasis Webifiers on their ships. If you are heavily webbed once you've built up a small amount of speed towards your alignment, your new maximum speed will be lower than your current speed, and you will be able to enter warp far sooner than usual. When placing a Cynosural Field near a station to immediately dock, take care not to place the beacon _too_ close to the station. If your freighter jumps through and lands _inside_ the station, they will be flung away at several hundred meters/second, and you will end up in an even more dangerous situation than if you had placed your beacon in empty space. You can write additional notes for Ark here. This page was last modified on 1 March 2019, at 09:25. This page has been accessed 44,761 times.